A variant in the promoter of the human uncoupling protein 2 (UCP2) gene, the G-866A polymorphism, has been associated with future risk of coronary heart disease events, in those devoid of traditional risk factors and in those suffering from diabetes. We thus examined the impact of the G-866A polymorphism on 5-year survival in a cohort of 901 post-myocardial infarction patients, and the impact of type-2 diabetes on this relationship. The association of UCP2 with baseline biochemical and hormonal measurements, including levels of the inflammatory marker myeloperoxidase, was also examined. UCP2 G-866A genotypes were determined using a polymerase chain reaction-restriction fragment length polymorphism (PCR-RFLP) protocol. Myeloperoxidase levels were measured in plasma samples taken from 419 cohort patients 24–96 hours after admission. Genotypes were obtained for 901 patients with genotype frequencies AA 15.5%, GA 45.5%, and GG 39.0%. Genotype was not associated with survival in the overall cohort (mortality: AA 15.6%, GA 16.8%, GG 19.4%, p = 0.541). However, amongst diabetics, AA and GA genotype groups had significantly worse survival than GG diabetic patients (p < 0.05) with an attributable risk of 23.3% and 18.7% for those of AA and GA genotype respectively. Multivariate analysis using a Cox proportional hazards model confirmed that the interaction of diabetes with genotype was significantly predictive of survival (p = 0.031). In the cohort's diabetic subgroup AA/GA patients had higher myeloperoxidase levels than their GG counterparts (GA/AA, n = 51, 63.9 ± 5.23; GG, n = 34, 49.1 ± 3.72 ng/ml, p = 0.041). Further analysis showed that this phenomenon was confined to male patients (GA/AA, n = 36, 64.3 ± 6.23; GG, n = 29, 44.9 ± 3.72 ng/ml, p = 0.015). Diabetic patients in this post-myocardial infarction cohort with UCP2 -866 AA/GA genotype have poorer survival and higher myeloperoxidase levels than their GG counterparts. Uncoupling protein 2 (UCP2) is expressed ubiquitously and is believed to dissipate the proton motive force across the inner mitochondrial membrane [1, 2]. While UCP1 may play a role in thermogenesis , UCP2 may regulate inflammation and apoptosis, and inhibition of the mitochondrial production of reactive oxygen species (ROS) . These functions have important implications for brain and heart disease. experimental inhibition of UCP2 expression increases ROS formation [5, 6], a risk factor for atherosclerosis . UCP2 has recently been shown to mediate some of the actions of ghrelin , a circulating hormone elevated during fasting and with known actions on the heart . Polymorphisms in the UCP2 gene have been associated with obesity [10–12], hypertension , and diabetes . A common variant in the promoter of the human UCP2 gene (G-866A, rs659366) has been associated with differential UCP2 expression  and elevated levels of markers of oxidative stress amongst diabetics [15, 16]. The A allele has been associated with enhanced UCP2 expression in adipose tissue in vivo. Indeed, in a prospective study of 2695 men, those with -866AA genotype exhibited a greater prevalence of obesity and hypertension, and a shorter time to first coronary heart disease (CHD) event. This risk was amplified fourfold in diabetic -866AA men . The enzyme myeloperoxidase (MPO, EC 1.11.1.7) is mainly released by activated neutrophils with pro-oxidative and pro-inflammatory properties. Given the role of inflammation in atherogenesis, MPO is a biomarker of coronary artery disease . Meanwhile, infiltrating macrophages and neutrophils play a role in the destabilization of coronary artery plaques and thus in the pathogenesis of acute coronary syndromes including myocardial infarction (MI). We thus hypothesized that the UCP2 G-866A polymorphism might be associated with survival in a study sample at high risk of future cardiovascular events, and that this relationship might be stronger amongst diabetics. Given the proinflammatory role of UCP2 , we also sought association of UCP2 genotype with plasma MPO levels in this group. Patients were admitted to Christchurch Hospital between November 1994 and June 2001 and recruited to the Christchurch Post-Myocardial Infarction (PMI) study using criteria described previously . Briefly, MI was defined by typical ischemic symptoms, ischemic change (including ST-elevation or depression or dynamic T-wave changes, i.e. includes ST-elevation, non-ST-elevation, Q-wave, and non-Q-wave infarcts) in two or more electrocardiogram leads and peak elevation of plasma creatine kinase (CK) to at least twice the upper limit of normal. All patients were troponin-T positive. Inclusion criteria included age <80 years, absence of immediate heart failure or cardiogenic shock, and survival for at least 24 h after the onset of symptoms associated with MI. Patients were followed for 5 years and data on mortality/survival for the full 5 years of follow-up was available for all patients in the cohort. Blood samples and cardiac imaging were obtained 24–96 h after symptom onset. Clinical events were determined from recruitment questionnaires, planned follow-up clinic visits, patient notes, the New Zealand National Health Information Service and hospital Patient Management System databases. Ethnicity was self-declared and was grouped as those of European, Maori, Not Stated and Other (Asian, African and Pacific Islanders) ancestry. The investigation conforms to the principles outlined in the Declaration of Helsinki and was approved by the Canterbury Ethics Committee. All participating patients provided written, informed consent. Genomic DNA was extracted from whole blood as previously described . DNA (100 ng) was amplified for the UCP2 G-866A PCR-RFLP assay, in which 360 bp amplimers were digested for 16 h at 37°C using 2.5 U of Mlu I . The digested, gel-electrophoresed fragments were visualized using a Bio-Rad Fluor-S™ imaging system. Circulating levels of endothelin-1, ANP and B-type natriuretic peptide (BNP) and N-terminal pro-BNP (NTproBNP) were assayed as previously described . creatinine clearance was calculated using the Cockcroft-Gault formula . Levels of creatine kinase (CK) were measured using ELISA kits (Roche Diagnostics, Auckland, NZ). Left ventricular function was assessed by radionuclide ventriculography – within 24–96 hours of onset of MI (within 24 hours of blood sampling) . Myeloperoxidase (EC 1.11.1.7) was measured by sandwich ELISA on plasma diluted 1:10, with a monoclonal antibody (Abcam, Cambridge, United Kingdom) and a rabbit polyclonal antibody produced in-house , with a detection range of 0.3 to 25 ng/ml and coefficient of variance of 13.8%. Univariate analysis, relating UCP2 G-866A genotype status to other variables, was performed using χ2 and ANOVA tests. Skewed data (notably plasma hormones) were log-transformed. Survival was assessed using Kaplan-Meier survival curves and log-rank tests. Due to the small number of UCP2 -866 AA patients for which MPO levels were available data for AA and GA patients was grouped for this analysis. A Cox proportional hazard model was used to investigate independent risk factors for all-cause mortality. The model included established predictors of prognosis (age, gender, NTproBNP and CK levels, admission left ventricular ejection fraction (LVEF), β-blocker treatment, and creatinine clearance) [20, 22, 24, 25]. Statistical significance was deemed to be achieved at the p < 0.05 level. The statistical power of the study was estimated from the cohort's likely genotype split of ~15% (AA) and ~42.5% (GG or GA respectively)[11, 15] with a total n of ~900 and an event (mortality) rate of approximately 3% per annum and complete follow-up to 5 years. Thus there was 80% power to detect >10% difference in mortality between the two homozygote groups, using a two-tailed χ2 test, α = 0.05. All analyses were performed using SPSS version 16. Of an available cohort of 982, genotypes were obtained for 901 patients with genotype frequencies AA 15.5%, GA 45.5%, and GG 39.0% which did not deviate from the Hardy-Weinberg equilibrium (p = 0.999). The minor allele (A) frequency was 0.38, similar to that reported elsewhere [11, 15]. Baseline characteristics stratified by UCP2 G-866A genotype group are shown in Table 1, and did not differ from those in whom genotyping was not possible. Only patient gender was significantly associated with genotype, with the proportion of males increasing with the number of G alleles. Ethnicity was not significantly associated with differences in genotype frequency (minor allele frequencies: European 0.375, Maori 0.438, Not Stated 0.442, Other 0.371, p = 0.481). Baseline characteristics, drug treatment and neurohormonal data stratified by UCP2 genotype group. *Means (SEM) or occurrence (percentage); †Median (range); ‡Geometric mean (95% confidence interval). A total of 159 deaths were recorded in the study cohort during the 5-year follow-up. UCP2 G-866A genotype was not associated with survival in the overall cohort (mortality: AA 15.6%, GA 16.8%, GG 19.4%, p = 0.541). However when the cohort was stratified according to prior diagnosis of type-2 diabetes, genotype was significantly associated with survival amongst diabetic patients (Figure 1). Diabetic patients of AA or GA genotype had significantly worse survival than GG diabetic patients (p < 0.05), with an attributable risk of 23.3% and 18.7% respectively. 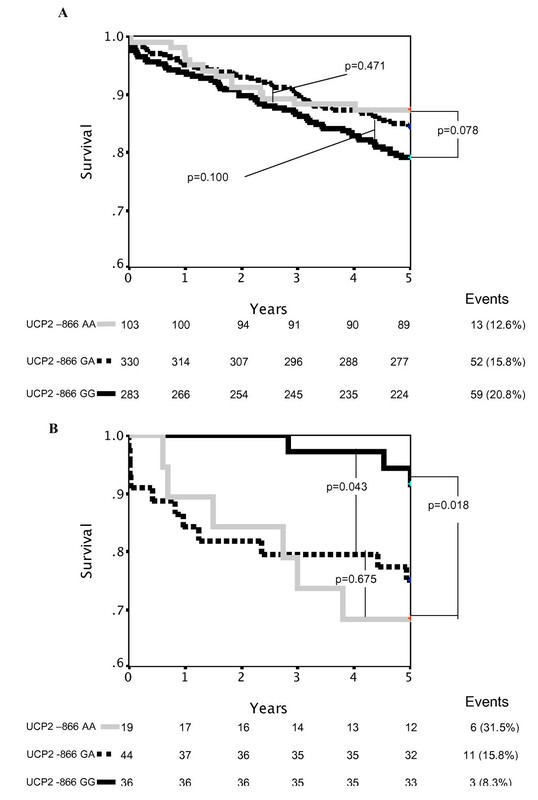 Multivariate analysis using a Cox proportional hazards model confirmed that UCP2 G-866A genotype alone was not a significant predictor of survival in the cohort, although there were trends in that direction (Table 2). However the interaction of diabetes with genotype was significantly predictive of survival in a model including age, gender, NTproBNP and CK levels, left ventricular ejection fraction, creatinine clearance, ethnicity, β-blocker treatment, diabetes and genotype (Table 2). Inclusion of additional covariates to the multivariate model did not add significantly to it (e.g. baseline total cholesterol Hazard Ratio = 1.17 [0.96–1.43] p = 0.131; mean arterial pressure HR = 1.01 [0.99–1.04] p = 0.240) and exceeded the recommended number of predictors given the number of events in the analysis. A Kaplan-Meier survival curve indicating differences in survival after MI for UCP2 G-866A genotype groups in A) non-diabetic patients and B) diabetic patients. Cox's proportional hazards regression model for mortality in the PMI cohort. * Hazard Ratio represents the change in risk for every 10-fold increase in measurement level. Plasma MPO levels were available from samples taken from 419 patients in the cohort 24–96 hours after admission. These patients were selected only by the availability of adequate stored plasma for the measurement of MPO and we believe this selection was essentially random. Whilst there was no overall association of UCP2 genotype, diabetic status or gender with MPO levels, there was a significant interaction of gender*diabetic status*UCP2 genotype in a univariate general linear model (p = 0.037). In the diabetic subgroup of the cohort, patients with at least one A allele had significantly higher MPO levels than their GG counterparts (GA/AA, n = 51, 63.9 ± 5.23 ng/ml; GG, n = 34, 49.1 ± 3.72 ng/ml, p = 0.041; Figure 2). This phenomenon was only apparent in male patients (GA/AA, n = 36, 64.3 ± 6.23 ng/ml; GG, n = 29, 44.9 ± 3.72 ng/ml, p = 0.015; Figure 2). There was no significant association between genotype and MPO levels in female diabetic patients (GA/AA, n = 15, 62.9 ± 9.99 ng/ml; GG, n = 5, 73.5 ± 6.17 ng/ml, p = 0.561) or amongst non-diabetic patients (data not shown). MPO levels did not differ significantly between diabetic and non-diabetic patients (diabetics, n = 85, 58.0 ± 3.27 ng/ml; non-diabetics, n = 334, 63.7 ± 2.21 ng/ml, p = 0.223). Plasma myeloperoxidase levels 24–96 hours after index patient admission stratified by UCP2 G-866A genotype and diabetic status a) Male and Female patients, b) Male patients. N = non-diabetic, Y = diabetic. Stars and circles indicate outlying data. The major finding of this study is that the interaction between type-2 diabetes and UCP2 G-866A genotype was significantly associated with survival in a cohort of post-MI patients. The UCP2-866A allele carriers had significantly worse survival during 5 years of follow-up post-MI than GG patients if they were diabetic. These data extend previous observations amongst otherwise healthy men in whom the UCP2 G-866A genotype was associated with future risk of CHD events, both in those individuals devoid of traditional risk factors for cardiovascular disease and amongst the small proportion of diabetic patients . In contrast a study of 3122 type-2 diabetic patients reported association of the UCP2 -866 A allele with decreased risk of incident coronary artery disease, including sudden cardiac death . The disease-free survival profile in this report closely resembles the survival curve for non-diabetic patients in our study (Figure 1A). This inconsistency may have several explanations: study endpoints differed (survival versus disease-free survival) and differing age and ethnic profiles. Diabetes is associated with increased oxidative stress  and diabetic patients with the UCP2-866AA genotype and CHD have been shown to have lower total antioxidant status and higher levels of plasma F2-isoprostanes . Elevated levels of plasma MPO, has previously been shown to be a predictor of mortality in the cohort studied in this report . The difference observed in MPO levels between GA/AA and GG diabetic patients was of similar magnitude to that observed between heart healthy control subjects and PMI patients in the previous report . We did not include MPO as a predictor in the multivariate model of survival as missing data would have severely restricted the number of patients in the analysis. While this data was not well powered to detect differences in MPO levels based on UCP2 genotypes groups, we did detect an association of MPO levels and genotype amongst diabetic patients in this study. This was particularly evident in male diabetic patients in the cohort, a finding consistent with previous reports of gender specific differences in oxidative stress [29, 30]. This finding of an association between UCP2 G-866A genotype and plasma MPO levels can be regarded as hypothesis generating and requires validation in other studies. Although the current study has considerable statistical power, due to the size of the cohort, the length of follow-up, the number of clinical endpoints recorded and the minor allele frequency of the G-866A polymorphism, statistically significant differences may have occurred by chance and weak associations may have been missed. Missing data for some parameters has limited the power of this study to investigate their association with genotype. The study cohort was dominated by ethnic Europeans and the results should not be extrapolated to other populations. Our data provide support for the idea that modulation of UCP2 expression might be an important novel target for reducing cardiovascular morbidity and mortality, particularly amongst diabetic patients . A growing body of evidence supports the UCP2 G-866A polymorphism as a marker of cardiovascular risk [15, 16, 32]. This study extends this evidence to include UCP2 genotype as a potential marker of prognosis in type-2 diabetes patients following acute MI. We thank the participants in the PMI study, Endolab and Christchurch Cardiology Outpatient staff. The Health Research Council and the National Heart Foundation (NHF) of New Zealand supported this work. CLD participated in the Butler-IFSA study abroad program at the University of Canterbury, Christchurch. APP held a Foundation of Research, Science and Technology Postdoctoral Fellowship and AMR held the NHF Chair of Cardiovascular Studies. BRP, SSD and HEM conceived the study and the experimental design and BRP, CLD and TJM performed the data acquisition and interpreted the results. TGY was responsible for hormone assay data acquisition and interpretation. BRP, CMF and HEM drafted the manuscript. APP, VAC, AMR, CCW, LS, SSD and HEM interpreted the results and critically reviewed the manuscript adding important intellectual content. All authors read and approved the final version of the manuscript.